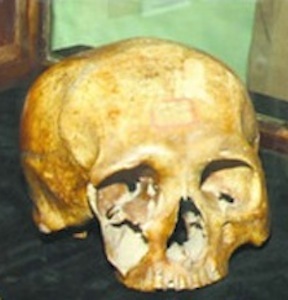 The skull of Henry Debosnys displayed at the Adirondack History Center Museum. The cranium of Henry Debosnys (1836-1883) is stored in a glass case on the upper floor of the Adirondack History Center Museum in Elizabethtown, NY. Debosnys was of French descent and born in Portugal in 1836. After traveling the world, he arrived in Essex County, NY in the spring of 1882. He met Elizabeth Wells, a widowed mother of four, in the spring of 1882, Henry Debosnys married her a few months later-making her his third wife. After Elizabeth disappeared shortly after the wedding, Debosnys told friends and neighbors that she went to visit relatives in a neighboring town. But they remained suspicious and started looking for her. Family friends soon discovered her body, and found that she had been shot in the head twice and her throat has been slashed. During the trial, investigators found that Debosnys’ previous two wives had died under suspicious circumstances. He was arrested, tried, convicted, and hanged for Elizabeth Wells’ murder on April 27th, 1883. He was the last man to be hanged in Essex County, New York. Not that he followed a long list of people, he was only the second. After the execution, Debosnys’ body ended up at a school as an anatomical specimen. But the cranium is all that his left of his remains. The cranium, noose, and various memorabilia from his trial are displayed at the Adirondack History Center Museum. There are more pictures of the display at J.W. Ocker’s Odd Things I’ve Seen. Ocker, J.W. (2012). The New York Grimpendium: A guide to macabre and ghastly sites in New York State. Woodstock, VT: Countryman Press.